Tropical Cyclone Marcus has developed off the coast of Australia's Northern Territory along the Cobourg Peninsula coast. NASA's Aqua satellite provided a view of the new storm from its orbit in space. NASA's Aqua satellite provided a visible light image of Marcus after it developed. The Moderate Resolution Imaging Spectroradiometer, or MODIS, instrument aboard Aqua revealed that Marcus's center of circulation just north of the Cobourg Peninsula. The image showed powerful thunderstorms circled the low-level center and extended in a band west of the center. 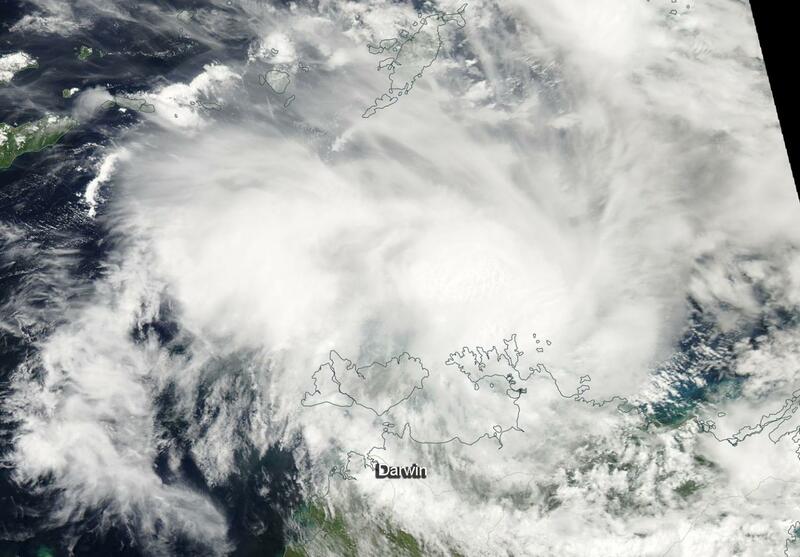 The Australian Bureau of Meteorology (ABM) posted a tropical cyclone warning from Goulburn Island to Wadeye, including Darwin and the Tiwi Islands. A tropical cyclone watch applies from Wadeye to Kuri Bay. On March 16, 2018, at 11 a.m. EDT (1500 UTC), Tropical cyclone Marcus had maximum sustained winds near 46 mph (40 knots/74 kph). It was centered near 11.1 degrees south latitude and 131.9 degrees east longitude, about 102 nautical miles northeast of Darwin, Australia. Marcus was moving to the south-southwest at 7 mph (6 knots/11 kph). ABM noted that winds with "gusts greater than 130 kph may develop over Cobourg Peninsula and eastern parts of Melville Island overnight as the tropical cyclone strengthens. Gales are expected to extend to Darwin and the remainder of the Tiwi Islands from early Saturday morning as the tropical cyclone passes through the Van Diemen Gulf. However, if the tropical cyclone crosses the coast east of Cape Hotham tomorrow morning, the tropical cyclone will likely weaken before approaching Darwin, reducing the chance of gales being experienced." ABM expects heavy rain over the northwest Top End tonight and on Saturday. A storm tide/storm surge is expected between Milikapiti and Goulburn Island, including the Van Diemen Gulf as the cyclone's center crosses the coast tonight. Tides are likely to rise significantly above the normal high tide, with damaging waves and dangerous flooding tonight and into Saturday morning. The Australian Bureau of Meteorology forecast calls for Marcus to move southwest, gradually turning to the west. The system will skirt the northwestern coast of Australia, moving near Darwin and Dundee Beach, then Kalumburu before moving into the southern Indian Ocean.